Designed with a tropical flair, the Agave Chair features a natural blend of natural materials with a wicker exterior, upholstered interior and exposed wood frame with elaborately turned legs. The versatile, casual design of this chair allows you to use it in a variety of rooms. Accent your living room, bedroom or veranda with the graceful sweeping profile of this chair and experience a calm and relaxed décor. Available in leather and fabric to fit your home. 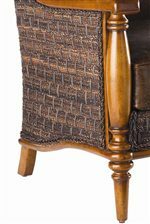 The Island Estate Agave Wicker Chair by Tommy Bahama Home at Hudson's Furniture in the Tampa, St Petersburg, Orlando, Ormond Beach & Sarasota Florida area. Product availability may vary. Contact us for the most current availability on this product. The Island Estate collection is a great option if you are looking for Traditional Tropical furniture in the Tampa, St Petersburg, Orlando, Ormond Beach & Sarasota Florida area.